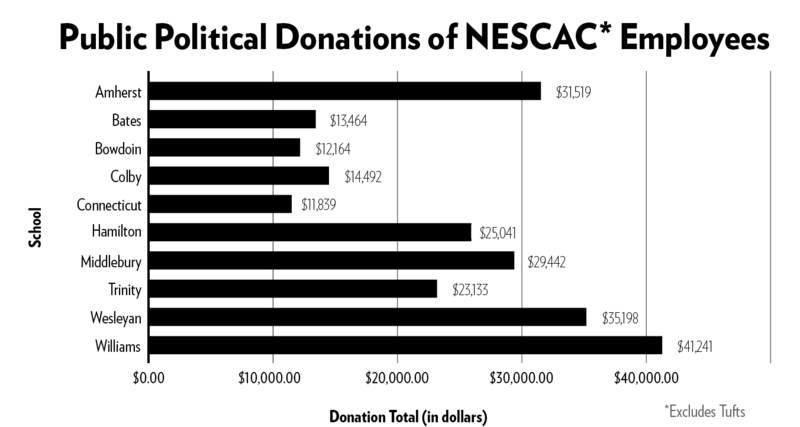 During the 2016 election cycle, Bowdoin employees donated less to political causes as a group than employees of many other NESCAC colleges. When Bowdoin employees did donate, none gave to conservative candidates or groups. According to publicly available records from the Federal Election Commission, Bowdoin employees donated the second lowest aggregate sum of any of the 11 schools in the NESCAC in 2016 with $12,164. Connecticut College employees donated the least with $11,839, and Williams College employees donated the most with $41,241. Data were not available for Tufts University. Individual donations from Bowdoin were relatively small in size—approximately 86 percent of the contributions were amounts of $100 or less. Bowdoin’s lack of conservative political donations—zero out of 179 separate contributions—was not unusual in the NESCAC: Colby College employees made zero conservative contributions out of 284 and Bates College employees made three out of 165—one to John Kasich and two to Donald Trump. With this one-sided giving, Bowdoin, Bates and Colby’s politically active employees appear to be far more liberal than their fellow Maine citizens who split 48% to 45% for Hillary Clinton and Donald Trump respectively on election day in 2016. These numbers, however, do not capture all political contributions. The Center for Responsible Politics—which runs the site OpenSecrets.org—notes that only some donations are available to the public. “Under federal law, all contributions of more than $200 to federal candidates, PACs, or parties must be itemized and disclosed to the Federal Election Commission. Donors must report their name, address, employer and occupation, and these records are publicly available from the FEC and several other websites,” according to OpenSecrets.org. Professor of Government and Legal Studies Michael Franz noted that the campaign finance system in the United States has a lot of transparency built into it. Though there is some non-disclosed money that is directed towards SuperPACs, it tends to be a relatively small amount. Traditional PACs are subject to both contribution limits and disclosure requirements. Of the 179 disclosed donations from Bowdoin employees, most went directly to candidates—with Hillary Clinton and Emily Cain receiving the highest number of separate donations. 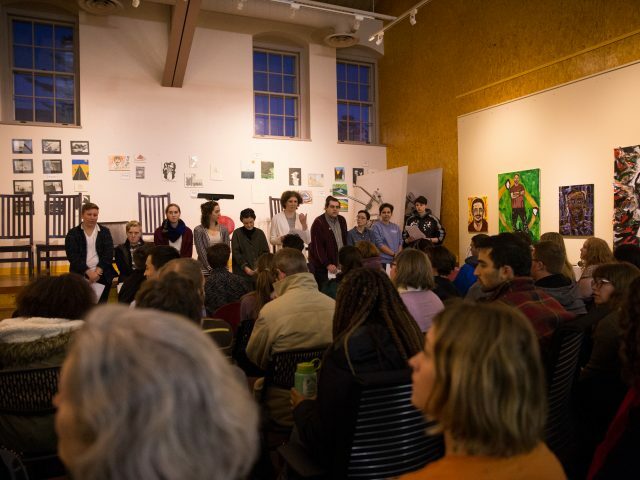 Among the 179 contributions from Bowdoin employees, most were from faculty and staff, though several came from students who listed their employer as the College. The two largest one-time reported donations came from Professor of Art History Pamela Fletcher and former college treasurer Catherine Longley. Fletcher gave $1,000 to Hillary Clinton and Longley gave $1,000 to Senator Angus King who—though an Independent—caucuses with the Democrats in the Senate. President Clayton Rose’s name does not appear on the list of donors for the 2016 election cycle. However, in past years, he has made several large political donations—particularly during his time in Essex Fells, NJ, where he donated mainly to the JP Morgan & Co PAC as well as to democratic candidates like Barack Obama. Rose donated $2,300 to Barack Obama’s campaign on February 29, 2008. This was in the midst of the heated primary campaign between Obama and Clinton. Rose, however, did make one conservative contribution while he was at JP Morgan: $1,000 to Republican Senator Phil Gramm of Texas—the then-chairman of the Senate Banking Committee. 100% of the faculty donations go to liberal causes — yet no call from the Orient for ANY sort of political diversity from the faculty. Why does the headline say “liberal causes”? I don’t consider Hillary Clinton liberal. 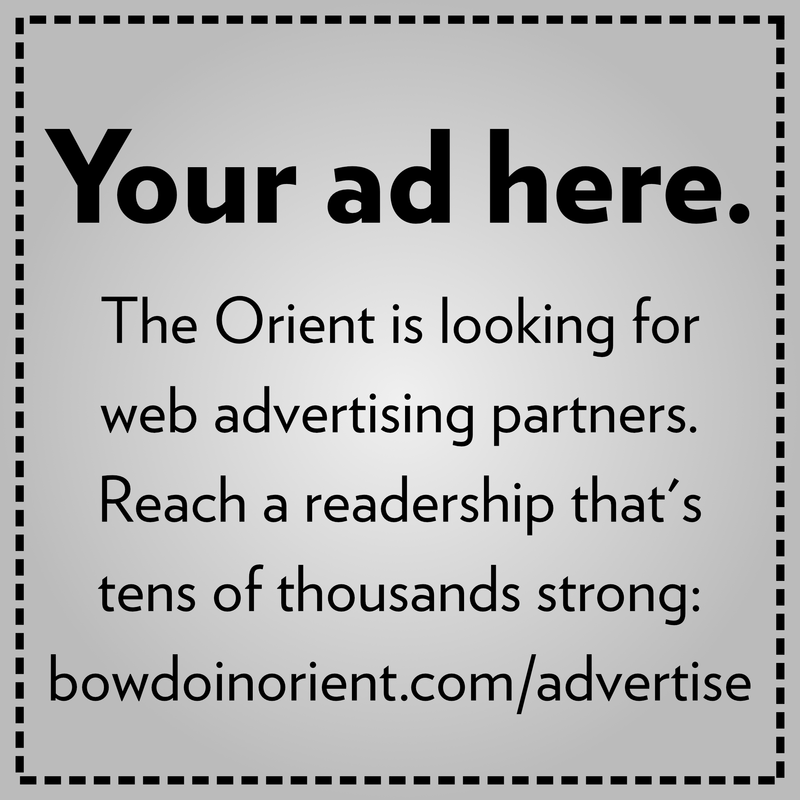 Does the orient? This headline feels very subjective. So many democrats are more centrist or conservative than liberal. Seriously? Hillary Clinton not on the liberal side of the spectrum? Seriously? Here is a 538 article that quantitatively assesses her positions: https://fivethirtyeight.com/features/hillary-clinton-was-liberal-hillary-clinton-is-liberal/. The fact that someone would argue she isn’t liberal when she spent the last 15 years representing the more liberal policy shows how out of touch at least this individual is. Let me guess — every registered Republican is a far right wing nut job? Every Republican view is way to the left while every Democratic view is center driven? Come on, have some perspective.